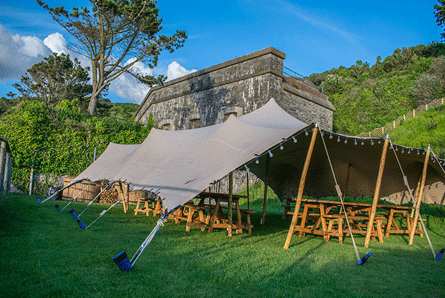 Stretch Tent offers an innovative alternative to the traditional peg and pole marquee tents. Stretch Tent are manufactured using 100% waterproof two way stretch super flexible material developed specifically for this application to create a unique event. The material is stretched out and poles are strategically placed to rig it off the ground. Stretch Tent are highly flexible and can be rigged in a variety of shapes and it can be rigged on uneven ground over and around trees and buildings, making them the perfect solutions for events. We have secured a strong client base, from small medium enterprises to large corporate companies, and our attention to detail and hands on management has ensured that our client base continues to grow. Our unanimous decision to sell high volumes at a lower margin allows us to pass on some very clear pricing advantages to our customers. Stretch Tent are available in a variety of colors, including white, red, blue, green, yellow, black and silver. Stretch Tent can be rigged to make the most stylist and efficient use of any space and be installed in a variety of configurations and locations that ordinary tents cannot, including balconies, rooftops, decks, pools and stages and can be applied to awkwardly shaped outdoor areas with dramatic effect and surprising ease, while providing full protection from the elements. They can be branded with images or artwork for corporate exposure and business advertisement. All our related products are manufactured to our unique design by technologically advanced manufacturing equipment which constantly undergo expansions and upgrading to keep in pace with our export and the demand for our kind of products. 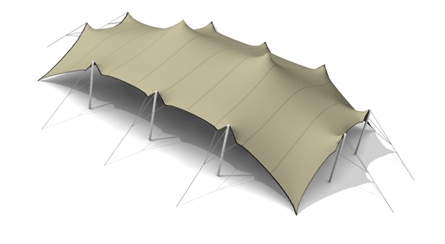 At Stretch Tent we have the expertise to manufacture a variety of tents depending on your requirements. We can tailor make your tent according to your specifications, starting from design, size, colour and use. Get Stretch Tents Sizes for 5m x 10m, 7m x 12m, 10m x 10m, 9m x 15m, 9m x 18m, 9m x 21m, 10m x 20m,9m x 24m,9m x 30m, 12m x 30m,15m x 30m,15m x 33m. Seating Capacity for 100, 150, 200, 250, 300, 370, 400, 430, 550, 700, 900, 1000 people. Stretch Tents delivers Stretch Tents, Stretch marquee, chairs and table in South Africa Provinces such as Eastern Cape, Free State, Gauteng, KwaZulu-Natal, Limpopo, Mpumalanga, North West, Northern Cape, Western Cape. Pietermaritzburg, Polokwane, Limpopo, Kimberley, Northern Cape, Nelspruit, Mpumalanga, Bloemfontein, Free State, Port Elizabeth, Eastern Cape, Pretoria, Gauteng, Durban, KwaZulu-Natal, Johannesburg, Gauteng. And African countries like Algeria, Angola, Benin, Ivory, Kenya, Lesotho, Liberia, Libya, Madagascar, Malawi, Mali, Mauritania, Mauritius, Morocco, Mozambique, Namibia, Botswana, Burkina, Burundi, Cameroon, Cape, Central, Chad, Comoros, Democratic, Republic, Djibouti, Egypt, Equatorial, Eritrea, Ethiopia, Gabon, Gambia, Ghana, Guinea, Niger, Nigeria, Rwanda, Senegal, Seychelles, Sierra, Sudan, Swaziland, Tanzania, Togo, Tunisia, Zambia, Zimbabwe.